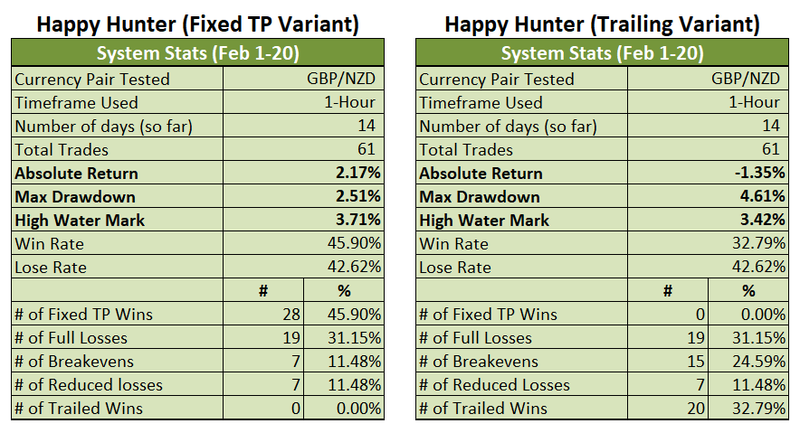 With February 19 done and over with, and February 20 about halfway done, it’s time for another update for the Happy Hunter Trading System! So, how did the most recent hunt go? Pretty bad, just to be blunt about it. It’s like the deer we were hunting ended up hunting us instead (even though a deer is an herbivore). Yes, it was that bad. February 19 was the most horrid trading environment (so far) since the day’s range only came in at a mere 70 pips. And remember, the average daily range on GBP/NZD is around 225 pips, based on historical data from 2007-2017. I guess I should rename it to the Not-So-Happy Hunter Trading System. Just kidding (a bit)! The month’s not over yet and the conditions that would disqualify the trading system and push me back into the drawing board haven’t been met yet, so no problemo (for now at least). Also, if you’re wondering what the numbers on the charts below are, they refer to the trade #, based on the chronological order when the signal was generated, not necessarily when the trade was executed. 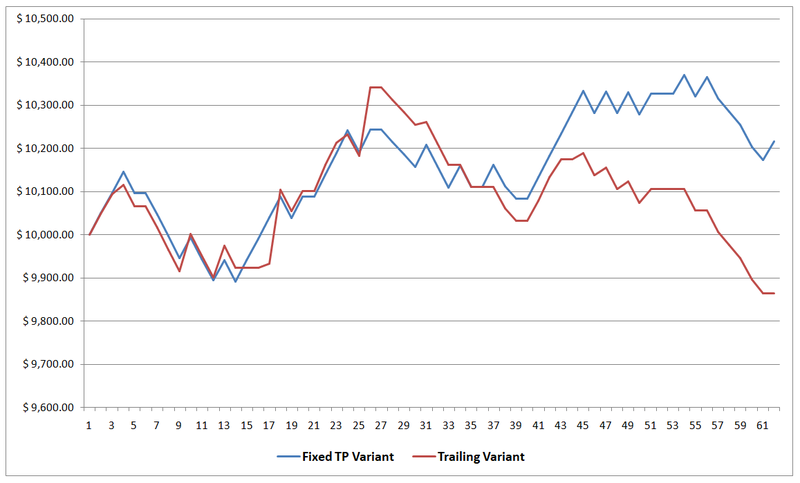 The Fixed TP Variant reached a new high water mark of 3.71% (+3.33% previous). That’s the good news. The bad news is that the system suffered from a string of losses so it now only has +2.17% in gains (was up by +3.21% last Friday). 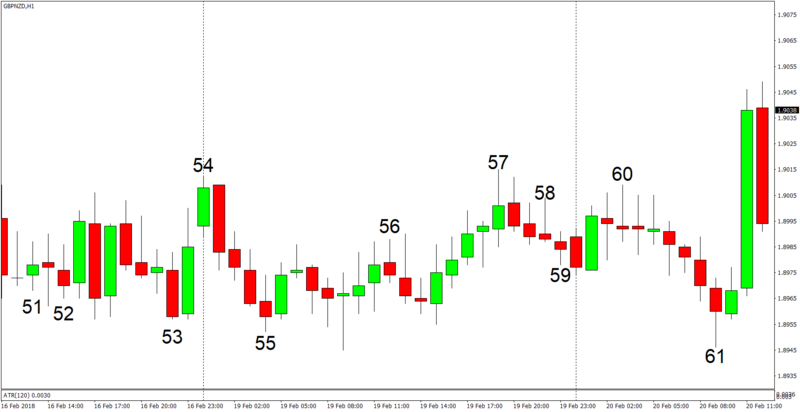 The day’s range for February 19 was only a measly 70 pips, which is really super tight, given that the average daily range on GBP/NZD is 225 pips, based on historical data from 2007-2017. This super tight trading environment meant that the system had difficulty reaching TP. However, there was enough volatility to reach SL on some trades. The choppy intraday price action also add to the problem. You can’t see it on the 1-hour chart for GBP/NZD that I posted, but the pair already reached an intraday high of 1.9058. And it just so happens that the TP for trade# 51 and 52 are 1.9058 and 1.9055 respectively. However, the choppy price action took out both trades at break even before kicking higher and hitting the TP of both trades, which is really annoying. Oh, well. The Fixed TP Variant is still a net winner for the month at least. The same can’t be said for the Trailing Variant, though, since it’s now down by 1.35% (was up by 1.07% last Friday). The Trailing Variant is having a really hard time this February because not only has volatility been tight, but GBP/NZD has also been trading sideways since last week, so there are just practically no trends to take advantage off, which is a horrible environment for a trend-riding system like the Trailing Variant. Anyhow, no worries (for now) since my 20% drawdown threshold is still a long way away. Hopefully, trading conditions will finally normalize on GBP/NZD soon. If not, I’m confident that the Fixed TP Variant will continue to survive for a while. However, things could get ugly for the Trailing Variant. By the way, I mentioned this before, but I’m currently working on some minor tweaks. I’m not done yet, but I’ll hopefully have them done by the end of the week or early next week. Okay, that’s it for now! And as always, I enjoy your feedback, so if you have any questions, or if you found an error somewhere, or you just want to say “hi”, then don’t be shy and write a comment down below!